Because we cannot always accept all who apply, sometimes difficult choices have to be made. Trying to base these decisions on need just doesn’t work since it is rare to find one who isn’t needy. Grades, the application, and family or community support all play an important role in the decision. Sister Ann accepted 15 of those students for the Jan. 2018 semester. We expect 8 to graduate this January, which will bring the number of current students to 33. When we visit, it’s not all work. This year we took some donated stethoscopes and lab coats to the students. They had such fun trying them on and posing for the camera. Never mind that the fit wasn’t perfect. They are thrilled to have them and will deal with it. Our first evening we had a reunion with some of the graduates. In order to attend, Ana, our river-riding doctor, (see the Sept. 12, 2016 blog) rode 5 hours one way in an ambulance with a patient who was being delivered to the hospital in Puerto Cabezas. She needed to return that night, another 5 hours on the road. These are the faces of 6 of the 22 doctors your donations have supported. It’s an honor for me to know these women. 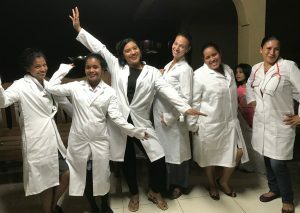 They are the groundbreakers, the dreamers, some of the first doctors to graduate from the first medical school in that area. You have helped to make it all possible. Congratulations. It doesn’t happen without your donations. Please continue to support us in 2018. We still have much to do. Happy, Healthy, and Blessed New Year from all of us.